Everything you need to know about the RISE app, launching after the Rise STO. Check out the details now. Everything you need to know about the RISE app which is going to launch after the Rise STO. Check out rise.eco for details. The team at RISE is working hard to build the most usable and intuitive crypto trading hub on the planet. A single app with support for 20+ crypto exchanges to manage your holdings, execute trades and orders and to find out about new trading opportunities. Further, the RISE Trading Hub will be your control center to subscribe to powerful Crypto Trading Algorithms managed by the RISE A.I. and to manage your RISE token holdings. Here’s a bit of background what we are building. The RISE application is a crypto trading & investing platform designed with a mobile-first user in mind. While the majority of internet traffic worldwide now originates from mobile devices, most crypto exchanges have a surprisingly poor user experience on the mobile screen. That’s why we built the RISE trading hub. We have assembled an all-star team that has previously built one of the world’s largest mobile-only virtual stock and forex trading platforms, to build a highly intuitive, fun and above all powerful mobile crypto trading experience. With support for over 20+ crypto exchanges, the RISE trading application will be a one-stop-shop for every crypto trader to manage their holdings, open new positions and to discover hot new trading opportunities. The RISE application is a powerful cross-platform crypto trading and investment application built on the React programming language. This will allow RISE to launch across multiple operating systems ensuring maximum compatibility with almost any mobile and desktop device. Further, the RISE platform is an extremely lightweight product which ensures that even in lower-bandwidth regions it will still run smoothly. Thus, from day one, the RISE application will be compatible with over 2B+ smartphones and web browsers around the world. Further, by launching outside the confines of the Apple AppStore and Google Playstore, the platform will have greatest flexibility when it comes to feature set and speed of version updates. The RISE trading hub allows crypto traders to conveniently subscribe to professional-grade automated trading algorithms powered by the RISE A.I. The algorithms will execute trades directly within the investors’ connected crypto exchange accounts which means that crypto holdings never actually have to leave the exchange — this is a major selling point. Investors can easily subscribe, stop or edit allocations to the RISE algorithms right from their phones. You can think of RISE as your A.I.-driven autopilot for your crypto portfolio that is monitoring your assets 24/7! 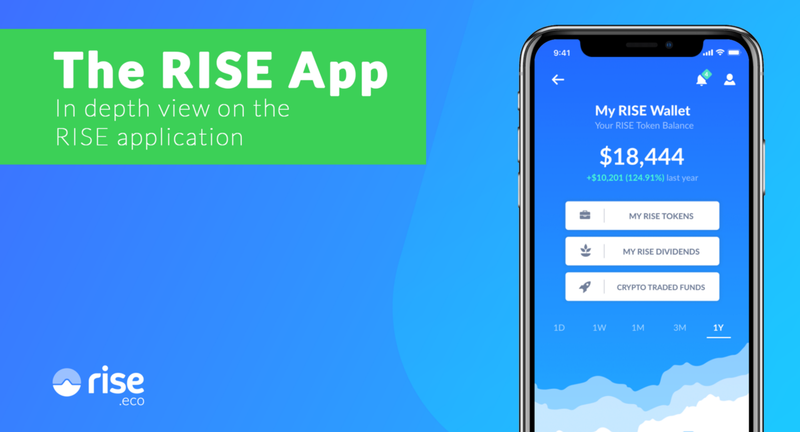 The RISE application allows token holders to manage their RISE holdings, invest them into a wide variety of crypto and non-crypto funds and to monitor their dividend payments from within the platform. A convenient dashboard gives an overview of your holdings as well as all cryptocurrency exchange wallets synced to the application. Your one-stop crypto trading and investing companion. Participate in the upcoming RISE Security Token Offering on November 1st at www.rise.eco — calculate your personal return now.